As soon as my kids learn to read I have them start reading a bible on their own. I know at first they didn't really get anything out of it or really understand what they were reading, but I wanted to create in them the habit of their own personal devotional time each day. My adult daughter recently told me that her reading comprehension is so much better than her peers & she thinks it is because she read her bible every day. Not only should our kids obtain bible knowledge, but they also must know what to do with it. 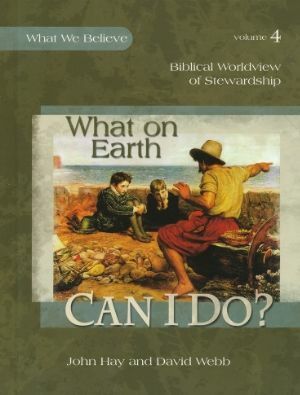 The last couple of years I have been using the What We Believe series from Apologia Educational Ministries with my girls, and we recently started volume 4 What on Earth CAN I DO?. What on Earth CAN I Do? was written by John Hay and David Webb. It is the fourth volume of the What We Believe series. 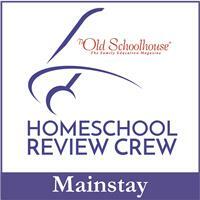 This curriculum is designed to help children see the world around them through God's Word. It is recommended for children ages 6-14, but it is actually a family study that talks about truths of the Christian faith. The curriculum includes the What on Earth CAN I DO? textbook, What on Earth CAN I DO? Notebooking Journal, What on Earth CAN I DO? Junior Notebooking Journal, and the What on Earth CAN I DO? Coloring Book. What on Earth CAN I DO? textbook~ This 240 page hardback book is available for $39.00. There are 8 lessons that contain several sections each. Each lesson opens with an introduction to the main topic and a overview of what was previously taught. There are short stories featuring kids and offering a glimpse into other world views. 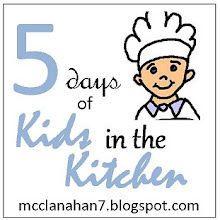 There are vocabulary words, memory verses, recipes, and thought provoking questions. Godly character traits that relate to the lesson are introduced and the lesson ends with a parable of Jesus. What on Earth CAN I DO? Notebooking Journal~ This 236 spiral bound notebook is $24.00. It includes lesson plans, blank note-taking pages, questions to answer, puzzles, mini books, and additional resource list for each lesson. It is recommended for students ages 10-14. What on Earth CAN I DO? Junior Notebooking Journal ~ This 184 page spiral bound notebook is recommended for children ages 6-9 and is available for $24.00. This notebook is set up the same way as the regular journal but the lessons are at a lower level, it includes drawing pages, and coloring pages. What on Earth CAN I DO? Coloring Book ~ This 64 page softcover coloring book is available for $8.00. It includes pictures that go along with the lessons & some of them are included in the Junior Notebooking Journal. 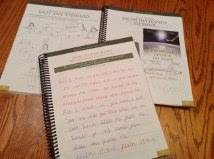 I used this curriculum with all three of my daughters ages 9, 12, & 13. 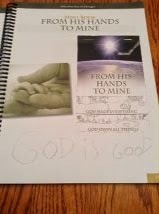 Even though the text is written directly to the student I read it out loud to my girls and then we took turns reading the bible selections provided. We answered the questions together to get all three of the girls included in the discussion. I had Delaney use the Notebooking Journal, Alaina used the Junior Notebooking Journal, and I had Amber write in a regular notebook. In this book we learn who is in charge of our lives and what we are trusted with in this life. We are introduced to people throughout the world who have done extreme things good or bad. We read about Adolf Hitler and move forward in history from there. 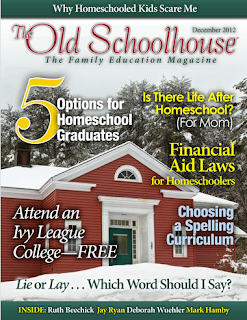 We read about Charlie Chaplin, Dietrick Bonhoeffer, the Iron Horse, and more. There is a story that is told throughout the book with children from England during WWII as the main characters. It is a continuous story throughout the book and we get a glimpse of the war from their lives. This book actually came to us at a perfect time. We had been studying about WWII and we just finished reading the Diary of Anne Frank. My girls were very intrigued with this story and actually wanted to skip ahead to read further ahead in it. The people we have been reading about and the story that is continued throughout the book really helped my girls get the big idea of each lesson. The text tells the student things they can do now and things they can accomplish later in life, and that stewardship starts with the little things. We have really enjoyed working through this book & Alaina loves her Junior Notebooking Journal. I think the questions and puzzles are a little to easy for her, but she loves to color and draw. The mini books were also a huge hit with her. She actually learns better by doing something, so the cutting and gluing helps her focus on the information taught. The puzzles and questions in Delaney's book are harder and bigger than in the junior notebook. Both of my girls like their journal's and take pride in completing their work. I had Amber write in a notebook about what we just learned along with her vocabulary words, and memory verses. Even though she is older and she thought she was too big for her own journal she really missed having the colorful journal and having puzzles that she could use. They have been sharing the coloring book, but for the price I should have ordered two more. 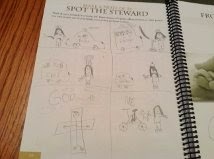 They would take turns each day coloring a picture in the book as I read the text. The What We Believe series does a really good job at teaching a Christian worldview. It starts by teaching us about God, then we take a look at ourselves, next we learn about our neighbors, and lastly we see what we can do here on this earth. We are finished with the first 3 books, and we are continuing this volume now. Volume 1 Who Is God? Volume 2 Who Am I? Volume 3 Who is my Neighbor? Volume 4 What on Earth CAN I DO?